The Windows Autopilot simplifies enrolling devices in Intune. Building and maintaining customized operating system images is a time-consuming process. You might also spend time applying these custom operating system images to new devices to prepare them for use before giving them to your end users. With Microsoft Intune and Autopilot, you can give new devices to your end users without the need to build, maintain, and apply custom operating system images to the devices. When you use Intune to manage Autopilot devices, you can manage policies, profiles, apps, and more after they're enrolled. For an overview of benefits, scenarios, and prerequisites, see Overview of Windows Autopilot. See the understanding powershell cmdlet for more information how to use it. 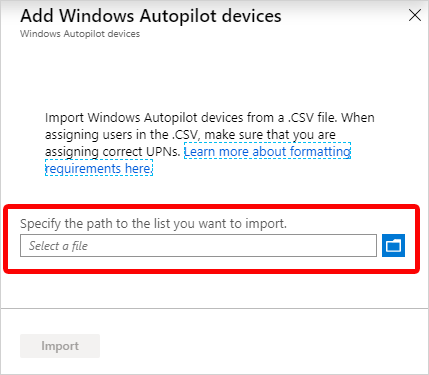 You can add Windows Autopilot devices by importing a CSV file with their information. In Intune in the Azure portal, choose Device enrollment > Windows enrollment > Devices > Import. Under Add Windows Autopilot devices, browse to a CSV file listing the devices that you want to add. The file should list the serial numbers, Windows product IDs, hardware hashes, and optional order IDs of the devices. Choose Import to start importing the device information. Importing can take several minutes. After import is complete, choose Device enrollment > Windows enrollment > Windows Autopilot > Devices > Sync. A message displays that the synchronization is in progress. The process might take a few minutes to complete, depending on how many devices are being synchronized. Refresh the view to see the new devices. In Intune in the Azure portal, choose Groups > New group. For Group type, choose Security. Type a Group name and Group description. For Membership type, choose either Assigned or Dynamic Device. If you chose Assigned for Membership type in the previous step, then in the Group blade, choose Members and add Autopilot devices to the group. Autopilot devices that aren't yet enrolled are devices where the name equals the serial number of the device. If you chose Dynamic Devices for Membership type above, then in the Group blade, choose Dynamic device members and type any of the following code in the Advanced rule box. After adding the Advanced rule code, choose Save. Autopilot deployment profiles are used to configure the Autopilot devices. In Intune in the Azure portal, choose Device enrollment > Windows enrollment > Deployment Profiles > Create Profile. If you want all devices in the assigned groups to automatically convert to Autopilot, set Convert all targeted devices to Autopilot to Yes. All non-Autopilot devices in assigned groups will register with the Autopilot deployment service. Allow 48 hours for the registration to be processed. When the device is unenrolled and reset, Autopilot will enroll it. 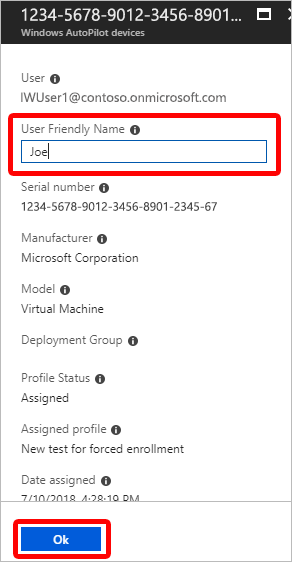 After a device is registered in this way, disabling this option or removing the profile assignment won't remove the device from the Autopilot deployment service. You must instead remove the device directly. User-driven: Devices with this profile are associated with the user enrolling the device. User credentials are required to enroll the device. Self-deploying (preview): (requires Windows 10, version 1809 or later) Devices with this profile aren't associated with the user enrolling the device. User credentials aren't required to enroll the device. In the Join to Azure AD as box, choose Azure AD joined. Language (Region)*: Choose the language to use for the device. This option is only available if you chose Self-deploying for Deployment mode. Automatically configure keyboard*: If a Language (Region) is selected, choose Yes to skip the keyboard selection page. This option is only available if you chose Self-deploying for Deployment mode. End-user license agreement (EULA): (Windows 10, version 1709 or later) Choose if you want to show the EULA to users. Privacy settings: Choose if you want to show privacy settings to users. Hide change account options (requires Windows 10, version 1809 or later): Choose Hide to prevent change account options from displaying on the company sign-in and domain error pages. This option requires company branding to be configured in Azure Active Directory. User account type: Choose the user's account type (Administrator or Standard user). Apply computer name template (requires Windows 10, version 1809 or later): Choose Yes to create a template to use when naming a device during enrollment. Names must be 15 characters or less, and can have letters, numbers, and hyphens. Names can't be all numbers. Use the %SERIAL% macro to add a hardware-specific serial number. Or, use the %RAND:x% macro to add a random string of numbers, where x equals the number of digits to add. Choose Create to create the profile. 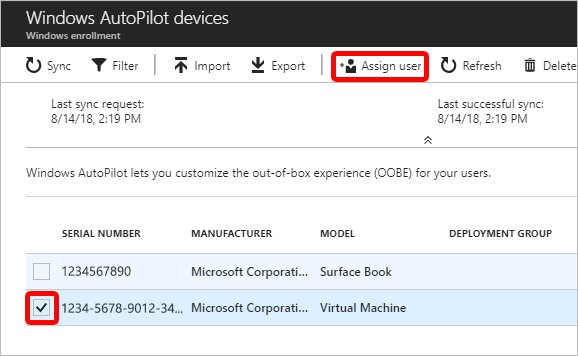 The Autopilot deployment profile is now available to assign to devices. *Both Language (Region) and Automatically configure keyboard are only available if you chose Self-deploying (preview) for Deployment mode (requires Windows 10, version 1809 or later). In Intune in the Azure portal, choose Device enrollment > Windows enrollment > Deployment profiles > choose a profile. In the specific profile blade, choose Assignments. Choose Select groups, then in the Select groups blade, choose the group(s) that you want to assign the profile to, then choose Select. Intune will periodically check for new devices in the assigned groups, and then begin the process of assigning profiles to those devices. This process can take several minutes to complete. Before deploying a device, ensure that this process has completed. You can check under Device enrollment > **Windows enrollment ** > Devices where you should see the profile status change from "Unassigned" to "Assigning" and finally to "Assigned." After you've created an Autopilot deployment profile, you can edit certain parts of the deployment profile. In Intune in the Azure portal, choose Device enrollment. Under Windows enrollment, in the Windows Autopilot section, choose Deployment Profiles. Select the profile you would like to edit. Click Properties on the left to change the name or description of the deployment profile. Click Save after you make changes. Click Settings to make changes to the OOBE settings. Click Save after you make changes. Changes to the profile are applied to devices assigned to that profile. However, the updated profile won't be applied to a device that has already enrolled in Intune until after the device is reset and reenrolled. Alerts will show how many Autopilot program devices don't have Autopilot deployment profiles. Use the information in the alert to create profiles and assign them to the unassigned devices. When you click the alert, you see a full list of Windows Autopilot devices and detailed information about them. To see alerts for unassigned devices, in Intune in the Azure portal, choose Device enrollment > Overview > Unassigned devices. You can assign a user to a specific Autopilot device. This assignment pre-fills a user from Azure Active Directory in the company-branded sign-in page during Windows setup. It also lets you set a custom greeting name. It doesn't pre-fill or modify Windows sign-in. Only licensed Intune users can be assigned in this manner. Prerequisites: Azure Active Directory Company Portal has been configured and Windows 10, version 1809 or later. In the Intune in the Azure portal, choose Device enrollment > Windows enrollment > Devices > choose the device > Assign user. 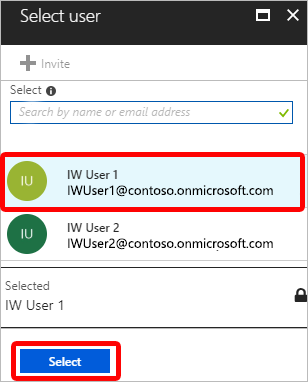 Choose an Azure user licensed to use Intune and choose Select. In the User Friendly Name box, type a friendly name or just accept the default. This string is the friendly name that displays when the user signs in during Windows setup. You can delete Windows Autopilot devices that aren't enrolled. If the devices are enrolled in Intune, you must first delete them from the Azure Active Directory portal. 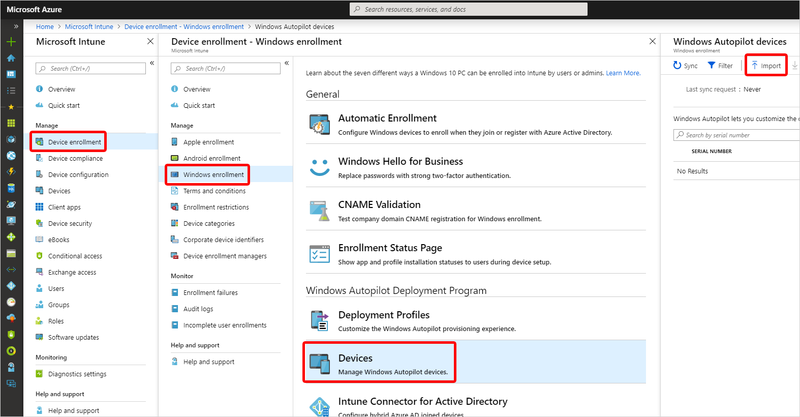 In the Intune in the Azure portal, choose Device enrollment > Windows enrollment > Devices. Under Windows Autopilot devices, choose the devices you want to delete, and then choose Delete. Confirm the deletion by choosing Yes. It can take a few minutes to delete. You can group Windows devices by a correlator ID when enrolling using Autopilot for existing devices through Configuration Manager. The correlator ID is a parameter of the Autopilot configuration file. The Azure AD device attribute enrollmentProfileName is automatically set to equal "OfflineAutopilotprofile-<correlator ID>". This allows arbitrary Azure AD dynamic groups to be created based off correlator ID by using the enrollmentprofileName attribute. Never name Autopilot or Apple DEP profiles beginning with "OfflineAutopilotprofile-". After you configure Windows Autopilot for registered Windows 10 devices, learn how to manage those devices. For more information, see What is Microsoft Intune device management?